Alpacas are members of the camelid family. Alpacas stand approximately 36 inches tall at the withers. 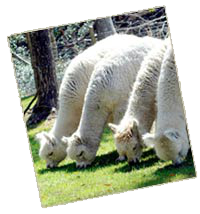 Alpacas weigh between 100 to 200 pounds. Alpacas are mild tempered, curious and demand very little. Indigenous to South America, the alpaca’s winning attribute is its beautiful fleece. 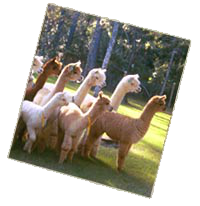 Alpaca fiber is processed into yarn for knitting and weaving or sheet goods. Alpacas require small amounts of food since they have a three-compartment stomach. Alpacas are easy on the land due to their padded feet. Five to ten alpacas can be successfully raised on one acre of land. Manure is kept to a communal spot thus reducing parasite infestation. Alpacas come in 22 distinct colors. Gestation is approximately 345 days. Alpaca fleece has no grease or lanolin so it is naturally hypoallergenic. A baby alpaca is called a cria. Alpacas (lama pacos) are members of the camelid family, “cousins” to the vicuña, guanco, and llama species of South America, and the Bactrian and Dromedary camels from Asia and Africa. This family of animals originated on the plains of North America about 10 million years ago. The South American story of alpaca started three million years ago when a wild form of “Hemiauchenia” migrated from Panama into South America. The “Hemiauchenia” flourished across South America and were ultimately the sole members of the camelid family. Eventual migration into the Andean Highlands developed two new strains, Palaeolama and Lama. These creatures were believed to have originated approximately 2 million years ago. The new genera was shorter limbed and changed their dentition (dental) to accommodate the their mountain habitat. Palaeolama spread back through the Pacific Coastline through Mexico and into Texas, Louisiana, Mississippi and Florida. The extinction of Palaeolam, and Hemiauchenia came around 12,000 years ago leaving only Lama, (the wild guanaco) and Vicugna, (the wild vicuna) in South America. Two wild species, vicunas and guanacos emerged. The camelid migration to Asia from North America also began around three million years ago. Their passage occurred via the land connecting Alaska to Siberia. This resulted in the evolution of the one humped dromedary camel of Africa and the two humped Bactrian camel of Asia. All six species share the same diploid chromosome number and can be interbred to produce live offspring. This was done in 1998 with the birth of Rama, the union of a dromedary father and a guanaco mother. This feat combined genes that had been separated for 3 million years. The birth of a “cama” has potential for the commercial values i.e. : an animal stronger and larger than it’s counterparts. It is believed that about 6,000 years ago alpacas were created through selective breeding. DNA confirms that alpaca originated from the vicuna. Vicugna pacos is the alpaca’s assigned name. Confusion sometimes exists in the two uniquely coated alpacas, the suri and huacaya. Although different in coats, the two animals are of the same species. While many people in the U.S. are not yet familiar with the luxury of alpaca, they have a long and illustrious history in South America. The first records of domestication are Andean Mountain cave drawings, etched with great care over 5000 years ago; making the alpaca perhaps the first domesticated animal in the world. Even then, they brought prosperity and renown to the civilizations of native peoples in Peru, Bolivia, and Chili. In addition, the great Incan Empire also flourished around these valuable creatures. First importation of alpaca into the United States was in 1984. The Registry closed any further importation in 1998. This was done to protect our national herd. No more alpacas can be brought into the United States. Only twenty years later the industry is already seeing both growth in demand and genetic improvements of the alpaca and its fleece. Over 65,000 alpacas are now owned throughout the country. Better animal husbandry and nutritional care along with selective breeding practices are allowing breeders to achieve finer fiber and greater yields in each generation.